To cap off National Women’s Health Week, Healthcake is releasing the results of a recent online study it conducted of women’s health concerns and the sources of insight they rely on for answers. The research targeted a sample of 400 women between ages 18 and 54 who live in Texas. It revealed that 43% of women represented in the target sample are conducting health searches online at least once per month. They are hunting for explanations of symptoms, conditions and treatments in 57%, 38% and 24% of cases, respectively. 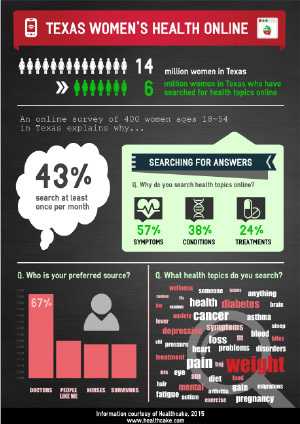 This insight points to how a sudden symptom or a recent diagnosis is a familiar trigger of health inquiries online. Not surprisingly, doctors were the preferred source of information among 67% of respondents. Perhaps it’s more interesting to note that when asked about their preferred sources of information, 30% of women in the survey also responded “People like me” while 27% said nurses and 27% chose survivors. Among the topics respondents are interested in, some of the more commons ones were weight, pain, cancer, diabetes, depression and mental health. Categories: e-Caregiver, e-Patient, e-Supporter, e-Survivor, Healthcake, Search, Social Media, Word of Mouth Online (WoMO) | Tags: Survey, Women's Health, Word of Mouth Online | Permalink. We have just completed the beta of Healthcake, the online personal assistant that helps you discover cures and manage wellness across different websites so you can make faster, better health decisions. We learned so much from our users and thank them for their commitment to making Healthcake an even better experience for everyone. We also went live today with brand new mobile apps for iPhone, Android and Windows Phone. Now our users can find the help they need on the go and connect with resources in their local area. Isn’t it better when you find an answer to a health question AND you can take immediate action on what you learned? A no-brainer. Categories: e-Caregiver, e-Patient, e-Supporter, e-Survivor, Healthcake, Mobile, Search | Permalink. My eyes were glued on a series of research reports published by the Pew Research Center in 2013 and 2014. Since then, the Pew Internet: Health fact sheet has been published and I find myself equally intrigued like a feline attracted to catnip. A quick glance at the flurry of stats sprinkled throughout the page reveals a piping hot trend: healthcare is at a tipping point. Fewer than 30% of Americans have yet to search for health information online. Conversely, over 70% already have. Over 30% of adults who are age 50+ or living with multiple chronic diseases have used the Internet to search for health information. 30% of people who had a serious health issue turned to non-medical sources for help. Over 30% of U.S. adults say that at one time or another they have gone online specifically to try to figure out what medical condition they or someone else might have. Over 30% of those who are tracking their health indicators are also sharing their records or notes with another person or group. More than ever before, most Americans are one of four types of people – either e-Patient, e-Survivor, e-Caregiver or e-Supporter – increasingly using the Internet to search for health information online. Many are relying on non-medical sources and the knowledge shared by others to try to figure out a diagnosis before they go to a doctor. Healthcake is an online personal health assistant that brings health stories together from different sites based on a person’s health interests, making it less time-consuming to find quality content, ratings and reviews. What type of e-person are you? Categories: Affordable Care Act, e-Caregiver, e-Patient, e-Supporter, e-Survivor, Insurance Exchanges, Search, Social Media | Permalink.